An argument that Einstein's theory of relativity was no stroke of genius but, rather, a logical development of ideas already in the air. 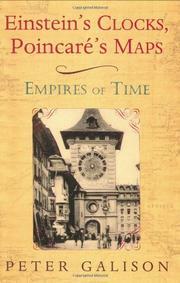 The problem of synchronizing timepieces was a preoccupation of many turn-of-the-century scientists, writes Galison (History of Science/Harvard; Image and Logic, not reviewed), and notable among them was Henri Poincaré, head of the French Bureau of Longitude. The growth of railroad networks and of the modern military made standardized time an issue of sweeping importance; the Franco-Prussian war had been decided largely by the German ability to mobilize its forces and deliver them to the front by rail. In addition, the creation of accurate maps depended critically on comparing the local time of astronomical events with the time at a standard location; accurate, synchronized clocks were essential. Poincaré, a product of the French École Polytechnique, was trained to consider a scientific subject for both its practical and theoretical implications, an orientation reinforced by his work on longitude. Several of Poincaré’s publications argue against the idea of absolute time, a point that would be a central issue in the relativity theory. Nor was Einstein a pure theoretician; his work at the Swiss patent office required evaluating inventions of all sorts, and a number of chronometers and techniques for electronic synchronization went through the office during his tenure there. In fact, the “crowning step” in Einstein's 1905 formulation of special relativity appears to have been an insight on the synchronization of clocks. Galison is careful to list the key differences between Einstein’s and Poincaré’s descriptions of time and space, but his key point seems clear: the theory of relativity was up for grabs, and Poincaré came close to capturing it well before Einstein. A richly detailed account of the interplay of scientific and technical issues at the beginning of the modern era.